Download co_SaveAs_dst.Zip file , Extract it. 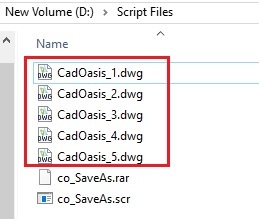 Create ‘Script Files’ folder in D: Drive or change Path in above Script file. You Script Files folder will be as below after Script run. You can Change pah to desired path on your PC also you can change dwg file name to your file name. Readers are requested to save/back up work before trying any Customization code also try it on blank files .